Providing deep-cleaning, restroom sanitation and hygiene services to gyms, athletic clubs, daycare centers, hospitals, country clubs, assisted living facilities, retail, restaurants and more throughout Greater Pittsburgh, Western Pennsylvania, Cleveland and the West Virginia panhandle. Is Your Pittsburgh Company Bathroom Really Clean? Read on to learn more about our Sani-Services program or call to speak with our team and schedule an inspection today (412) 462-5525. Just because you pay a janitorial service to come to clean your restrooms every week, doesn’t mean that disease-causing bacteria don’t lurk everywhere the eye cannot see. 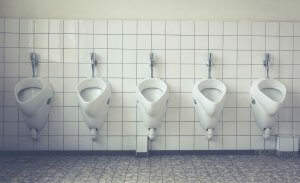 The truth may be difficult for a harried business owner or manager to take, but the time has come to face the fact that effective restroom cleaning really begins after the janitorial staff leaves the building. The appearance of clean is just that; namely, an illusion. Bathroom fixtures, for example, may often look spotless but porcelain surfaces, such as soap dispensers and sinks, are havens for harmful bacteria and germs. Door-knobs, stalls and almost every tactile restroom surface are also vulnerable to bacterial invasion. This situation is constantly compounded by the fact that every time someone flushes a toilet, millions of particles containing pathogens are released into the air, and they can spread up to twenty feet! Enviro-Master Pittsburgh refers to the branch of Enviro-Master that services businesses of all types throughout Pittsburgh, Western Pennsylvania and surrounding tri-state areas. This leading purveyor of commercial restroom services for all types of commercial enterprises has earned an outstanding reputation for excellence in both the products it offers and its customer service. Dedicated to promoting superior bathroom hygiene, their comprehensive program includes: tile and grout deep cleaning; hand soaps and soap dispensers; air fresheners and the Sani-Services program. We also provide additional services such as; hand sanitizers, paper product programs; hand towels, toilet paper and dispensers (manual or touch-free options), as well as drain maintenance. We have been operating throughout Pittsburgh and its environs for more than four decades. Teamed with mother company, Air-Scent, in addition to its hygienic programs, they also offer excellent environmental odor control and air-freshening solutions. We pride ourselves on the fact that all of their products are 100% green and that their carbon footprint has continuously contributed to a safer environment for future generations. What is The Sani-Service Program? Enviro-Master works in conjunction with a company’s janitorial staff even though the Sani-Services program technically picks up where they leave off. It is no mark against their efforts or skill, as it is impossible for standard commercial cleaning chemicals to eliminate bacteria from the deep pores of porcelain fixtures. Enviro-Master Pittsburgh's unique sanitizing product removes odors and attacks disease-bearing pathogens and germs at their source and it is the only such product on the market today. Highly trained technicians insure that a commercial restroom is completely sanitized and free from pathogens. Sani-services provide the deepest, most thorough cleaning possible. Products treat all porcelain fixtures and remove built-up uric acid and trapped bacteria. A germicidal coating is generously applied to urinals, toilets and sinks, which are all hot beds for germs and gram-positive bacteria. Sani-services don’t end here even after this incredibly extensive sanitation process. The finishing touch is a Sani-Guard germicidal fog, which has a dual function. It protects bathroom surfaces and prevents them from absorbing germs until the experts at Enviro-Master return on their next monthly visit. When employed in conjunction with our odor control and air freshener systems, our paper product refill program and our Sani-Scrub cleaning services, your company's restroom hygiene needs are fully met, and then some. Simplicity can be the key to happiness within a busy work environment where little time is delegated to what may seem like little details. But bathroom hygiene is no little matter, and Sani-Services go far beyond sanitizing and disinfecting company bathrooms. Whether a commercial enterprise is a restaurant; auto showroom; daycare; gym or fitness center; hospital; retail store or assisted living facility, Sani-Services can make life easier by checking and taking care of those little details that business managers are too preoccupied to concern themselves with. These include: checking and filling air fresheners and replacing odor neutralizing, scented urinal screens at no additional cost. Indirectly, this special program can affect and improve workplace health and morale and create a positive, cost-effective experience for consumers and an upward trend in that all-important bottom line. Pestco Professional Services acquired the Pittsburgh and Western Pennsylvania territory for Enviro-Master services in 2014 as an addition to their pest control and air-freshener business, Air-Scent International. This leader in ambient air-care products and services that has been in continuous operation since the 1940s is the source of all of Enviro-Master's environmental odor and air-freshening tools and solutions. This business merger has resulted in a seamless blending of skills, products, experience and services that offer the best and most cost-effective bathroom hygiene protocols and professional, highly effective air freshener systems that money can buy. Enviro-Master is one part of a three pronged initiative that includes pest-control and pest-management strategies provided by Pestco Professional Services, a local commercial pest management company, and environmental odor and air-freshening solutions supplied by Air-Scent International. These services are all bundled into one-cost-effective package and the vast array of options represent the most affordable and efficient collection available on the market today. Commercial enterprises of all kinds within Pittsburgh and Western PA can now benefit from this serendipitous opportunity. Call Enviro-Master today at (412) 462-5525, and find out what good we can do for your company restroom.